On Time offers five distinct types of ambulance services: Basic Life Support (BLS), Specialty Care Transport (SCT), Bariatric transportation, event stand-by, and in some locations, Emergency Medical Services. Basic Life Support --- Including but not limited to: patient assessment, vital sign monitoring, immobilization (splinting), oxygen administration, airway adjuncts, and restraining combative patients. Specialty Care Transport --- Designed for patients who require advanced life support and specialized medical intervention or monitoring. Bariatric Ambulance --- Designed to accommodate overweight patients with care, safety, and dignity. All bariatric units are equipped with a heavy capacity stretcher, Hovermat® transfer system, ramps, and a heavy-duty winch that safely assists loading of the stretcher into the ambulance. 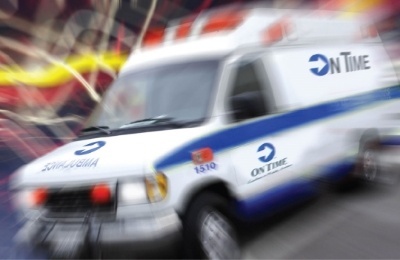 Emergency Medical Services --- On Time partners with communities in New Jersey to provide 9-1-1 emergency services 24 hours a day, seven days a week. Our team of experienced EMS professionals works with cities, counties, fire departments, and government agencies to ensure they receive the highest level of patient care. Our state-of-the-art communication department works in tandem with many healthcare facilities, and city and county EMS dispatch centers to provide urgent and emergency medical transportation. Stand by Ambulance Services --- Our emergency vehicle and crew will stay on scene for the entirety of your event due to potential hazards or high risk of injury during your event. Each of our ambulance drivers and EMTs are certified in CPR, and continually trained in patient sensitivity, lifts and transfers, and all aspects of safe medical transportation. All of our staff members undergo background checks and drug screenings. 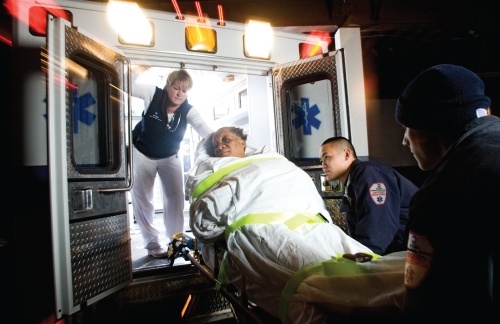 In addition, for Specialty Care Transport, each ambulance is staffed with a Registered Nurse and all activities are overseen by a Physician from Jersey City Medical Center, a level-two trauma center and teaching hospital. *Note: Medicare now requires Prior Authorization for ambulance transportation in New Jersey. This means that your doctor and/or care team will need to provide appropriate documentation to Medicare that fully explains why the ambulance services are medically necessary before services can be arranged. 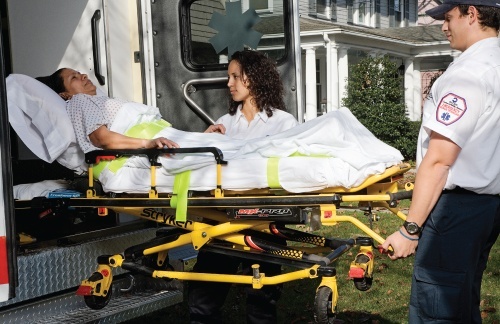 Stretcher (ambulance) transports from a hospital to a doctor’s office, nursing home, skilled nursing facility, or another hospital. *Note: Transportation for Medicaid recipients in New Jersey is scheduled through Logisticare. You must contact Logisticare to schedule the trip. While speaking with a representative from Logisticare, you may request a specific provider if you’d like. If you have private insurance, you will want to call the 800 number on the back of your insurance card and make sure that your requested ambulance services will be covered. On Time Ambulance participates in the following insurance networks: Aetna, Americhoice, AmeriHealth, Bravo Health, CHN, Cigna, First MCO, First Trenton Indemnity, HealthNet, Horizon Blue Cross Blue Shield of NJ, Liberty Mutual, MagnaCare, Multiplan, NJ Manufacturer’s, Oxford Healthcare, Three Rivers Provider Network, and United Healthcare. If you are looking to pay privately, please contact us at (908) 298 9500 or use our online scheduling form. We will reply to your inquiry as soon as possible and give you a detailed quote. We accept most major credit cards, as well as personal checks and can process payments securely here on our website. To schedule a trip, contact our customer care specialists at (908) 298 9500, or use our online scheduling form. We prefer to have at least 24 hour advance notice, but we are often able to accomodate last-minute requests. If you'd like to cancel a scheduled trip, please notify us at least 24 hours prior to the scheduled pickup time. Our headquarters is alwasy open so you can scheulde any time, day or night.